Continuous casting is the process whereby liquid steel is solidified into a semi finished product for subsequent rolling in the finish rolling mills. Continuous casting of steel was conceived and patented in 1865 by Sir Henry Bessemer, but it could not be commercialized because of problems related to engineering and equipment. After solving these problems, continuous casting of steel was introduced commercially in 1950s and around 1475 million tons of continuous cast steel was produced globally in 2012. Continuous casting has replaced several steps during steel making process such as ingot casting, mould stripping, heating in soaking pits, and primary rolling with one operation. Continuous casting of steel has helped to achieve improved yield, quality, productivity and cost efficiency. The principle of continuous casting is shown in Fig. 1. 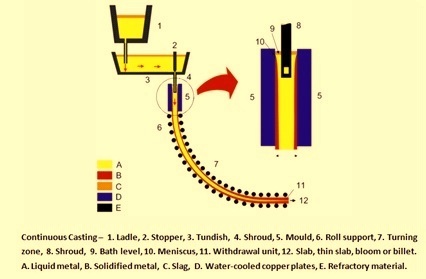 Referring to Fig 1, Liquid steel in the steel teeming ladle (1) from the secondary steel making unit is taken to the continuous casting machine. The ladle is raised onto a turret that rotates the ladle into the casting position above the tundish (3). Liquid steel flows out of the ladle into the tundish, and then into a water-cooled copper mould (5). Solidification begins in the mould, and continues through the roll support (6) and the turning zone (7). The continuous cast strand is then straightened, torch-cut, and then discharged for intermediate storage or hot charged for finished rolling. Depending on the product end use, various shapes are cast. In conventional continuous casting machines these are slabs, blooms or billets. In recent years, the melting, casting, and rolling processes have been linked while casting a shape that substantially conforms to the finished product. These near net shape cast sections are usually applied to beams and flat rolled products, and results in a highly efficient operation. In the case of near net shape casting, the complete process chain from liquid steel to finished rolling can be achieved within two hours. Billets have cross section with sizes up to about 150 mm square. Blooms have cross section either square or rectangular with size of each side ranging from greater than 150 mm to less than 500 mm. Round castings include diameters of 125mm to 500 mm. Beam blanks are shaped like dog bones, and are subsequently rolled into I- beams. Slabs are cast with size range of thickness from 150 mm to 400 mm, and width from greater than 500 mm to 2500 mm. The width to thickness ratio, referred to as the ‘aspect ratio’, is used to determine the dividing line between blooms and slabs. An aspect ratio of 2.5:1 or greater constitutes an as-cast product referred to as a slab. Thin slab has thickness in the range of 50 mm to 90 mm. In the design of continuous casting machines the following are the important considerations. The above factors dictate the continuous machine design parameters such as the number of cast strands and casting speed which must match the liquid steel supply to the continuous casting machine. Quality and grade of the steel to be cast are utilized in determining various design parameters of the casting machine such as its length, vertical height, curved or straight mould, water versus air mist cooling, electromagnetic stirring etc. There are two steps which are involved for the transfer of liquid steel from the steel teeming ladle to the mould of continuous casting machine. These are (i) transferring or teeming of liquid steel from the teeming ladle to the tundish and (ii) transfer of liquid steel from the tundish to the moulds. Regulation of liquid steel flow from tundish to mould occurs through orifice devices of various designs such as slide gates, stopper rods, or metering nozzles, the latter controlled by tundish steel level adjustment. A tundish, located above the mould to feed liquid steel to the mould at a regulated rate. A water cooled copper mould which is also the primary cooling zone, through which the liquid steel is fed from the tundish. It generates a solidified outer shell sufficiently strong enough to maintain the strand shape as it passes into the secondary cooling zone. A secondary cooling zone in association with a containment section positioned below the mould, through which the strand, the major portion of which is still in liquid state, passes and is sprayed with water or air mist for further solidification of the strand. An unbending and straightening section except in case of straight vertical casting machines. A severing unit (cutting torch or mechanical shears) to cut the solidified strand into pieces for removal and further processing. The main components of continuous casting machine are as follows. Tundish – The shape of the tundish is typically rectangular, but delta and ‘T’ shapes are also sometimes used. Nozzles are located along its bottom for the distribution of liquid steel to the moulds. The tundish also serves several other key functions which include (i) enhances oxide inclusion separation, (ii) provides a continuous flow of liquid steel to the mould during the exchange of ladles, (iii) maintains a steady liquid steel height above the nozzles to the moulds, thereby keeping steel flow constant and hence casting speed constant as well (for an open-pouring metering system), and (iv) provides more stable stream patterns to the moulds. Mould – The main function of the mould is to establish a solid shell sufficient in strength to contain its liquid core upon entry into the secondary spray cooling zone. Key product elements are shape, shell thickness, uniform shell temperature distribution, defect free internal and surface quality with minimal porosity, and few non metallic inclusions. The mould is basically an open ended box structure, containing a water cooled inner lining fabricated from a high purity copper alloy. Mould water transfers heat from the solidifying shell. The working surface of the copper face is often plated with chromium or nickel to provide a harder working surface, and to avoid copper pickup on the surface of the cast strand, which can facilitate surface cracks on the product. Mould heat transfer is both critical and complex. Mathematical and computer modeling are typically utilized in developing a greater understanding of mould thermal conditions, and to aid in proper design and operating practices. Heat transfer is generally considered as a series of thermal resistances namely (i) heat transfer through the solidifying shell, (ii) heat transfer from the steel shell surface to the copper mould outer surface, (iii) heat transfer through the copper mould, and (iv) heat transfer from the copper mould inner surface to the mould cooling water. Mould oscillation – Mould oscillation is necessary to minimize friction and sticking of the solidifying shell, avoidance of shell tearing, and liquid steel breakouts. Breakouts can cause major damage to equipment and a large machine downtime is needed due to clean up and repairs. Friction between the shell and mould is reduced through the use of mould lubricants such as oils or powdered fluxes. Oscillation is achieved either hydraulically or via motor driven cams or levers which support and reciprocate (or oscillate) the mould. Mould oscillating cycles vary in frequency, stroke and pattern. However, a common approach is to employ what is called ‘negative strip’, a stroke pattern in which the downward stroke of the cycle enables the mould to move down faster than the section withdrawal speed. This enables compressive stresses to develop in the shell that increase its strength by sealing surface fissures and porosity. Secondary cooling system – The secondary cooling system consists of several zones, each zone is meant for a segment of controlled cooling of the solidifying strand as it progresses through the machine. The sprayed medium is either water or a combination of air and water. The heat transfer occurs in this region through all the three ways namely radiation, conduction and convection. The predominant form of heat transfer in the upper regions of the secondary cooling area is by radiation. As the product passes through the rolls, heat is transferred through the shell as conduction and also through the thickness of the rolls, as a result of the associated contact. This form of heat transfer follows the Fourier law. The third form of heat transfer mechanism occurs by fast moving sprayed water droplets or mist from the spray nozzles, penetrating the steam layer next to the steel surface, which then evaporates. This convective mechanism is as per the Newton’s law of cooling. The heat transfer in the secondary zones serves the functions of (i) enhancing and controlling the rate of solidification (ii) strand temperature regulation via spray water intensity adjustment (iii) machine containment cooling. Shell growth – It is reliably predicted by the Fick’s law. This equation is also used to calculate the casting distance where the product is fully solidified (i.e. no liquid core remaining). Strand containment – The containment region is an integral part of the secondary cooling area. A series of retaining rolls contain the strand, extending across opposite strand faces. Edge roll containment may also be needed. The focus here is to provide strand guidance and containment until the solidifying shell is self supporting. In order to avoid compromises in product quality, careful consideration is required to be made to minimize stresses associated with the roller arrangement and strand unbending. Thus, roll layout, including spacing and roll diameters are carefully selected to minimize between roll bulging and liquid/solid interface strains. Strand support requires maintaining strand shape, as the strand itself is a solidifying shell containing a liquid core that possesses bulging ferro-static forces from head pressure related to machine height. The area of greatest concern is high up in the machine. Here, the bulging force is relatively small, but the shell is thinner and at its weakest. To compensate for this inherent weakness and avoid shell rupturing and resulting liquid steel breakouts, the roll diameter is small with tight spacing. Just below the mold all four faces are typically supported, with only the broad faces supported at regions lower in the machine. Unbending and straightening – The unbending and straightening forces are as important as strand containment and guidance from the vertical to horizontal plane are important. As unbending occurs, the solid shell outer radius is under tension, while the inner radius is under compression. The resulting strain is dictated by the arc radius along with the mechanical properties of the cast steel grade. If the strain along the outer radius is excessive, cracks can occur. This will affect seriously the cast steel quality. These strains are typically minimized by incorporating a multi point unbending process, in which the radii become progressively larger in order to gradually straighten the product into the horizontal plane. For starting the casting of a fresh heat, the bottom of the mould is sealed by a steel dummy bar, which is held in place hydraulically by the straightening withdrawing unit. This dummy bar prevents liquid steel from flowing out of the mould. The liquid steel poured into the mould is partially solidified, producing a steel strand with a solid outer shell and a liquid core. In this primary cooling area, once the steel shell has a sufficient thickness, about 10 to 20 mm, the straightening withdrawal unit is started and proceeded to withdraw the partially solidified strand out of the mould along with the dummy bar. Liquid steel continues to pour into the mould to replenish the withdrawn steel at an equal rate. The withdrawal rate depends on the cross-section, grade and quality of steel being produced, and may vary between 300 mm and 7,500 mm per minute. Casting time is typically 45 minutes to 90 minutes per heat to avoid excessive ladle heat losses. After leaving the mould, the cast steel strand enters a roller containment section and secondary cooling chamber in which the solidifying strand is sprayed with water, or a combination of water and air (air mist) to promote solidification. This area preserves cast shape integrity and product quality. Larger cross section requires extended roller containment. Once the strand is fully solidified and has passed through the straightening-withdrawal units, the dummy bar is disconnected, removed and stored. Following the straightening, the strand is cut into individual pieces of the as cast products (slabs, blooms, billets, rounds, or beam blanks depending on machine design).